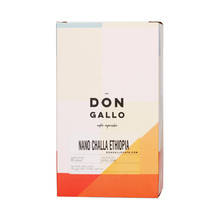 Don Gallo Cafe is a small-scale roastery from the sunny west of Spain. Only speciality coffee - top-quality arabica from the most remote places in the world. 250 g Colombia Ethiopia Guatemala Rwanda Whole bean 100% Arabica Honey Natural Washed light Pour over (Alternative brewing methods) Sort by: Price (Low to High) Price (High to Low) Product name a - z Product name z - a Highest rate Lowest rate New in!